2.ทำนายสกอร์แมตช์ “แดงเดือด” ลิเวอร์พูล – แมนฯยูไนเต็ด วันที่ 14 ต.ค.เพื่อลุ้นเป็น 100 คนแรกที่ทายผลการแข่งขันได้ถูกต้องในโพสต์กิจกรรมแล้วรับไปเลย แพ็คเกจรายเดือนฟรี! 9 ต.ค.เวลา 12.00 น.ไปจนถึง 14 ต.ค.เวลา 17.00 น. Entry is free and open to Thailand residents aged 18 and over at the time of Entry who have fulfilled the eligibility requirements as set out in these T&Cs (“Eligible Entrant(s)”). Employees (or family members of employees) of, any of, beIN SPORTS Asia Pte Limited, any companies associated with the Contest and promotion of the Contest and all affiliates of such aforementioned companies are not eligible. Only Eligible Entrants may be awarded and/or accept a Prize. By their participation in this Contest, Eligible Entrants are acknowledged to have read and agreed to these T&Cs for their Entry to be considered valid, and acknowledge that the decisions of beIN SPORTS are final and binding. Eligibility and participation in this Contest is contingent upon the Eligible Entrant’s compliance with these T&Cs and fulfilment of all other requirements set forth herein. These T&Cs shall prevail to the extent of any inconsistency with any other reference to this Contest. The contest begins on 9 October 2017 at 12:00 PM SGT and ends on 14 October 2017 at 5:00 PM SGT (the “Contest Period”). The winners will be contacted through Facebook direct message on or around 15 October 2017.
social media accounts used to participate in the contest must have its privacy settings set to “public”. Only one valid Entry per person will be permitted. Eligible Entrants found to be submitting multiple Entries may have all Entries invalidated. This is a skills based competition and chance plays no part in determining the winner. beIN SPORTS will notify the winners via the same social media channels used to submit the entry, Facebook in this instance, on or about 15 October 2017 (“Prize Winner(s)”). If any of the Prize Winner(s) do not respond and claim the Prize within forty-eight (48) hours after the date of notification, beIN SPORTS may then select a substitute winner and attempt to contact such substitute winner through Facebook in accordance with this clause 8 until all Prize Winners have claimed the Prizes (“Substitute Winners”). beIN SPORTS reserves the right to request Prize Winners sign an appearance release and waiver of liability, to provide proof of identity, proof of age, proof of residency, proof of subscription (in the case of a beIN SPORTS channel subscriber, evidence of a valid and fully-paid subscription to an authorized carrier of the beIN SPORTS channels including the relevant tier (if applicable) will be required) or any other relevant forms or agreements that beIN SPORTS deems necessary in order to claim a Prize. In the event that any of the Prize Winner(s) cannot provide suitable proof, the effected Prize Winners will be deemed to have forfeited the Prize in whole and no substitute will be offered. 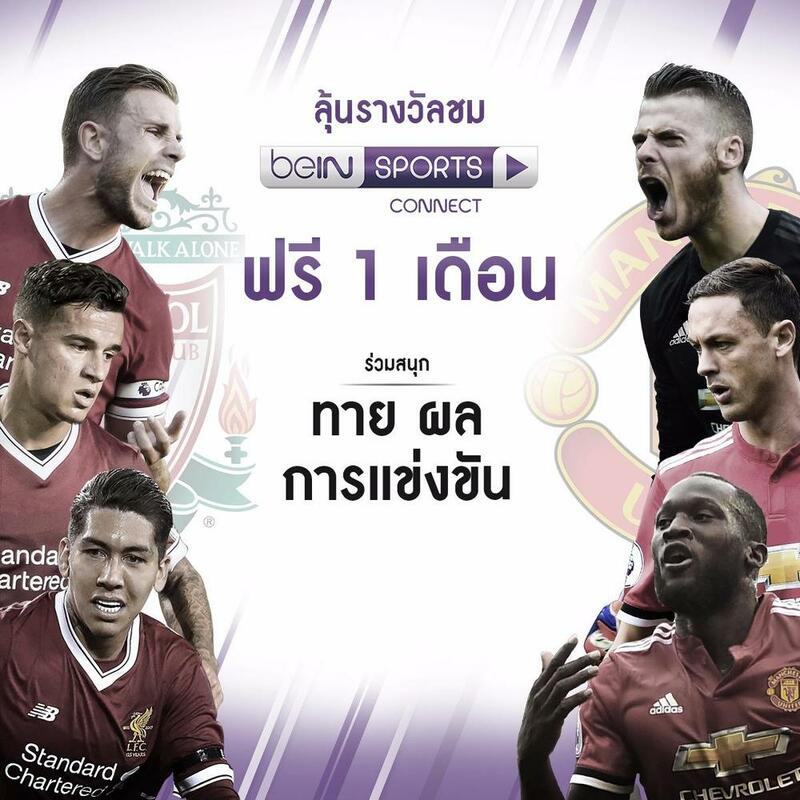 The total number of one hundred (100) prizes are available to be won, with each prize being a one-month Thailand beIN SPORTS CONNECT PASS (“Prize”). The Prize Winners may be invited to attend interview(s) arranged by beIN SPORTS If the Prize is not available or in the event of force majeure or unforeseen factors, beIN SPORTS may, without consultation or reference to the participants, substitute or replace any Prize with any other Prize of equal or similar value at the sole determination of beIN SPORTS. Cash will not be awarded as a substitute. It is a condition of accepting the Prize that the Prize Winners must comply with all the conditions of use of the Prize and Prize supplier’s requirements. Each Prize must be taken as stated and no compensation will be payable if a Prize Winner is unable to use such Prize as stated. beIN SPORTS does not guarantee that the Prize Winners will enjoy the Prize or be suited to the type of Prize that is offered. beIN SPORTS may refuse or disqualify any Entries (including winning Entries) if the Eligible Entrant concerned or anyone authorised by the Eligible Entrant to deal with their Entry, acts in a way towards either beIN SPORTS, its affiliates, partners, or their agents or staff which beIN SPORTS reasonably considers to be inappropriate, unlawful or offensive. If a Prize Winner is disqualified, beIN SPORTS reserves the right to award the Prize to a Substitute Winner in accordance to Clause 8 above. Prize Winners must continue to comply with all T&Cs, and winning is contingent upon fulfilling of all requirements. In the event that a Prize Winner is disqualified for any reason, beIN SPORTS will award the Prize to a Substitute Winner selected from all remaining eligible Entries in accordance with the process of selection of winners stated in clause 8 above. Nothing in these T&Cs limit, exclude or modify or purports to limit, exclude or modify the statutory consumer guarantees as provided under the Law on Consumer Protection 1999 (as amended) of Thailand or any similar consumer protection laws in Thailand (“Non-Excludable Guarantees”). This Contest, the T&Cs and any dispute or claim (including any non-contractual dispute or claim) arising out of or in connection with it, shall be governed by and construed in accordance with the laws of Thailand, and Eligible Entrants submit unconditionally to the jurisdiction of the appropriate courts of Thailand to deal with all matters relating to this Contest.